On our way to school, my friend Rahul and I used to play a very interesting game. We would count similar cars of a certain segment and whosoever had the larger count would win. That was ages ago but I still find myself counting cars at times. And if I had to pick a car today from the D-segment, which would help me beat Rahul, Skoda Superb would be it. The car may be the Czech carmaker's most premium offering but is still a very popular choice in India and a common sighting in any of India's big cities. 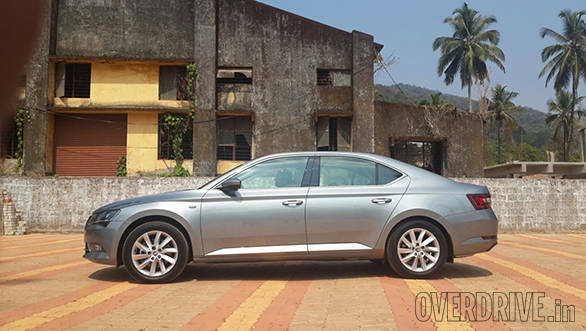 After a successful run with the second generation Superb, Skoda has introduced the all-new Superb in India. Does it better everyone's expectation? We drove from Mangalore to Coorg to find out. The Superb is known for its presence and the new generation car has loads of it. Gone are the limousine-like proportions. It's still a large car but the added width adds a lot of character. 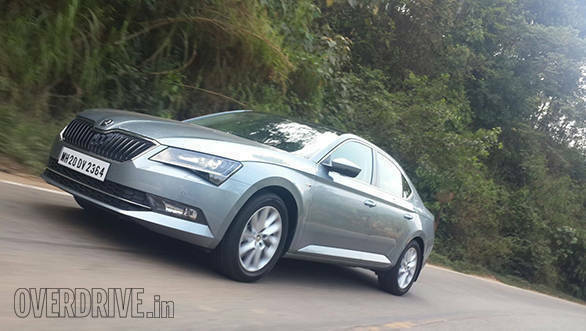 The sharp looks have evolved from the VisionC concept and a lot of the concept's details have been carried forward to the Skoda Superb. 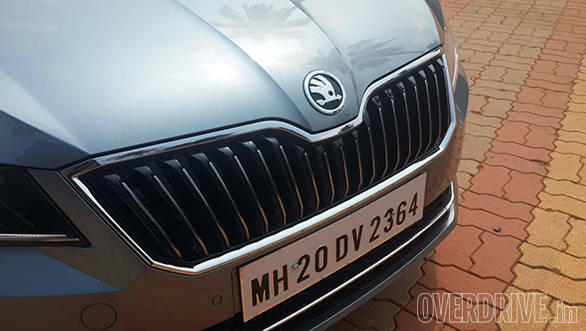 The face gets Skoda's family grille while the rest of the design only makes the front end look a lot more aggressive than before. The headlamps follow the edgy theme seen in the Octavia but they are sharper and there's a lot of detailing inside them - like the illuminated eyelash-like pattern and the striking L-shaped DRLs. Skoda says that the lamps draw inspiration from a renowned Bohemian glass cutting technique. The car is longer than its predecessor while the wheelbase has also increased. However, the more coupe-like roofline, as opposed to a traditional three box-layout, makes the Superb stand out especially when compared to other D-segment cars. The shoulder line runs from the headlamp all the way to the tail lamp and to go with the aggressive styling theme, it's a lot deeper and prominent at the doors. The Skoda Superb is offered with two alloy wheel designs depending on the variant. Although the Style and L&K variants get 17-inch wheels, the latter gets the more stylish multi-spoke pattern. The rear end gets large split lamps that feature a neat looking C-shaped pattern. 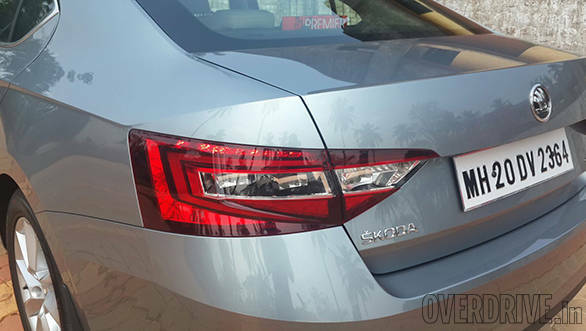 The tail lamps extend onto the bootlid and the angular shape follows the Skoda design signature seen in all of its siblings. All Superb variants also get an electric panorama sunroof as standard. Gone is the rotary knob to control it, and in its place is a push/pull switch, which is easier to use. 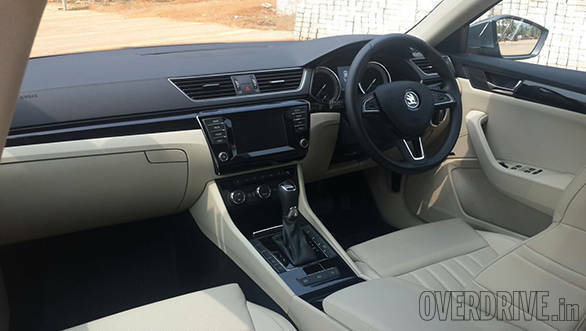 The previous Superb's biggest USP was its interior space, and Indians fell in love with the car for the ample kneeroom and comfort it offered. The new generation model takes these benefits to a whole new level. Front and rear passengers get more elbow and shoulder room while the front seats offer better under thigh and side support. Rear kneeroom (another Superb USP) is better than almost every car available in India now. There's also a footrest to add to the comfort. The only thing missing is the effective pillar-mounted AC vents that the earlier Superb featured. In terms of storage, there are a lot of compartments, holders and pockets. The front armrest, for instance, gets a huge storage compartment with a cooling option. 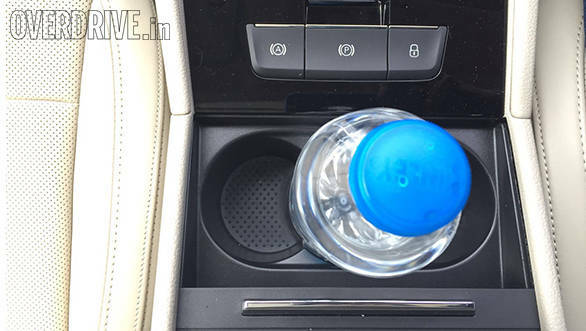 A bottle/cup holder is placed in front of the armrest and can hold more than two bottles if needed. An interesting thought is an anti-slip feature. The cooled glovebox is large too while the rear armrest gets bottle holders as well and if opted for, a tablet/mobile phone mount. Boot space is enormous and almost station wagon-like. 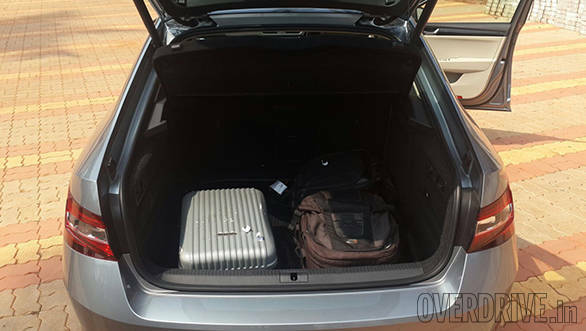 The Superb tailgate opens like a hatchback only (no twin-door like the previous Superb) so this means the boot opening is much larger than in a sedan. There's 625 litres available which further increases to a whopping 1760 litres with the rear seats folded. Step inside and an attractive design that features quality materials welcomes you. The elegant dual-tone dashboard looks premium and uncluttered. It's more like an evolved Octavia inside. 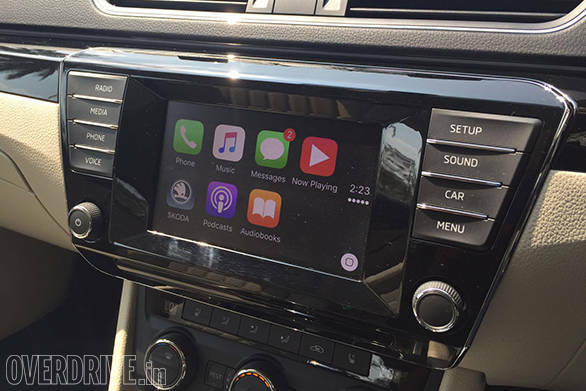 The centre console gets a large 6.5-inch TFT touchscreen that offers good resolution and a host of features like the SmartLink system that supports Mirror link, Apple CarPlay and Android Auto. Then there's ambient LED lighting featuring three colours (white, green & blue) running along the inserts on the dashboard and door pads. The 2016 Skoda Superb is offered with two engine and transmission options like its predecessor. The 1.8 TSI and 2.0 TDI engines have been updated though. 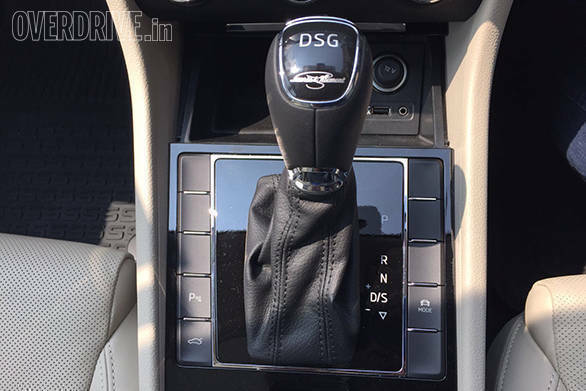 While the diesel is only available with a 6-speed DSG, the petrol gets either a 7-speed DSG or a 6-speed manual transmission depending on the variant. The 2.0 TDI produces 177PS between 3,600rpm and 4,000rpm while peak torque is a healthy 350Nm available from as low as 1,500rpm. The ARAI claimed fuel efficiency is 18.19kmpl. 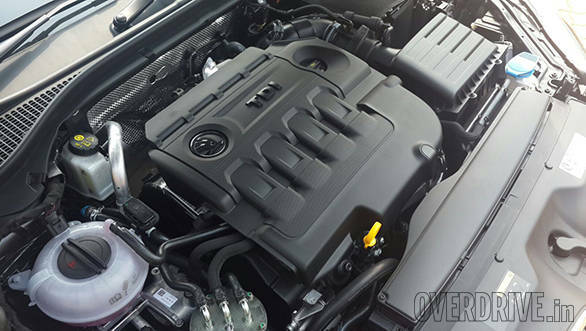 The 1.8 TSI motor produces 180PS from 4,000rpm to 6,200rpm in the manual while the DSG-equipped petrol produces the same power at a higher range between 5,100rpm to 6,200rpm. Interestingly, the manual model produces higher torque than the DSG-equipped Superb (320Nm compared to 250Nm). ARAI claimed efficiency is 14.12kmpl and 14.67kmpl for the petrol MT and AT respectively. We drove the diesel variant first, which we think will be more in demand. The updated engine is a more silent than before and when inside the car, is barely audible. NVH levels have improved a great deal too. There's ample power and torque through the rev range and the car is a delight to drive on the highway as well as crowded cities. Turbo lag is minimal and the power delivery is seamless. There are various drive modes too  Eco, Normal and Sport (only in the L&K trim). Sport mode uses a map that's a lot more aggressive and isn't as better suited in town and for highway cruising as the Eco or Normal modes. There's also an Individual mode that let's one customize the steering weight, engine map and other functions. The 6-speed DSG offers smooth and quick shifts but in automatic mode, the system takes a while to detect before downshifting. This can be annoying at times. Driving up the twisty uphill sections to Coorg, there were times when the transmission refused to downshift for a few seconds despite full throttle input. The TSI variant we tested was a Style variant featuring a 6-speed manual. The turbo petrol motor feels a lot more eager and is more involving to drive than the diesel. Triple digit speeds come in no time and it's a delight to shoot from one traffic light to another or on the highway. The manual transmission and the TSI motor work well together. Lot of petrolheads in India swear by the 1.8 TSI so despite the Superb being luxury focused, it's still entertaining behind the wheel. The motor is very refined and better engine insulation only improves NVH levels. 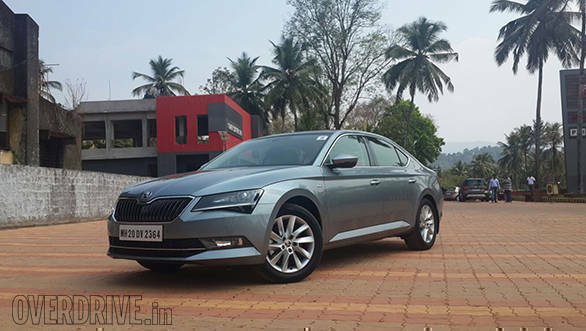 The Superb has always focused on ride over handling but the new model does both quite well. Being based on the MQB platform, the chassis is more rigid and light at the same time. This, along with a multi-link rear suspension, adds to the dynamics. For a car with a large footprint, the Superb diesel is quite lightweight (1,565kg). A wider track and sticky Hankook Ventus Prime tyres also add to the grip. The steering weight can be adjusted but it is still quite light to operate even when it is weighted up. It isn't a downer and in fact comes handy driving through town and over long distances. It is precise, although it could have been slightly more involving. The Skoda Superb overall offers neutral handling and surprisingly doesn't feel like a large car to drive. Ride quality is impressive too with the suspension tuned for India and set more on the softer side. Body roll is controlled while high-speed stability is quite good. 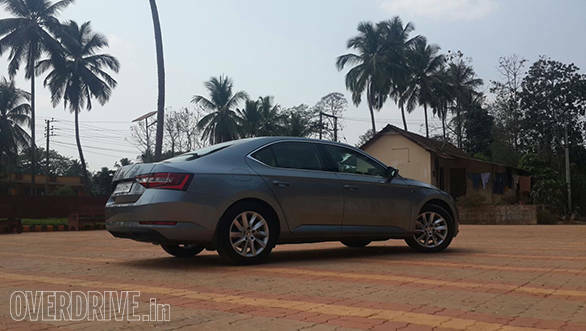 The tyres make a difference and we are glad that the Hankooks are softer and stickier compared to the Goodyears offered in the previous Superb and new Octavia. This car can't be a Superb without a long list of features and the new generation car offers all the bells and whistles you could as for. While we spoken about a few comfort and safety features earlier, there are a lot more on offer. So many that the brochure uses three pages to list out all the features. The more affordable Style variant gets a lot of features too. Offered as standard are leather seats, adaptive bi-xenon headlamps, hill-hold control, multi collision brake (a system that automatically shuts off the engine after it detects an accident when the airbag is deployed), an electro-mechanical handbrake, 8 airbags, parktronic sensors, keyless entry and ignition, puddle lights, 12-way adjustable driver seat, 6.5-inch touch screen, dual-zone climate control and two Skoda umbrellas that sit inside the front doors. The L&K trim, in addition to the features on the Style, also gets Piano black inserts, ambient lighting with three colour modes, fatigue detection, a tyre pressure monitor, three-zone climate control, air conditioned front seats, a virtual pedal (swipe your foot under the rear bumper and the boot opens. Voila!) and an electrically operated bootlid. Additionally, it gets an electric front seat adjustment button for the rear passengers. And help me beat Rahul again!